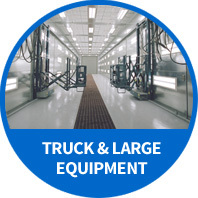 If you are painting cars, trucks and industrial equipment, a paint booth is essential for a professional finish. Paint booths are multi-purpose work areas that collect airborne residue and filter air during the coating process. We have both standard and custom size truck/large equipment paint booths, industrial paint booths and automotive paint booths. Paint booths have two main functions. The first is gathering “overspray” during the application process—which is the paint or coating that gets into the air. Containing overspray stops chemicals from permeating your shop or escaping into the atmosphere. A paint booth’s second main function is filtering incoming air to remove dust and other floating particles. Filtered air is important for creating glass-like finishes and inhibits contamination of your shop’s air quality. Paint booths provide more than just consistent production quality. Paint and coating sprays are flammable and hazardous to breathe, so confining these chemicals to a limited area is crucial. The only way to ensure proper containment is a booth. Keeping your work space ventilated is integral to your employees’ safety, and a spray booth maintains proper air flow with precision. There are many applications for paint booths in the automotive and manufacturing industry. 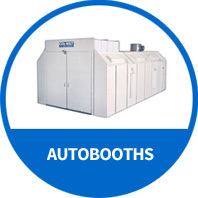 The basic variations depend on if you want an open or closed booth to filter incoming and outgoing air or only exhausted air. The equipment you are painting and the space you are working within are the major factors that will determine what kind of booth to install. Part of the booth design is the air flow. Whatever degree of air filtration and type of air composition you want, there is an air makeup unit for your operation. It all comes down to controlling the air flow both in and out of the booth with the correct pressure, temperature and timing. Proper air flow consistently keeps dust and dirt out so you can maintain perfect finished results and low energy costs. The degree of air quality you want to achieve in your work space will determine if you need an open or closed booth model and why type of airflow. Automotive painting requires a very clean working environment because the smallest pieces of dust can ruin a finish—which means lots of time wasted in wet sanding and buffing the vehicle to remove the dirt. While industrial equipment may be more tolerant of imperfections, many shops require paint booths that are positive pressure so the booth does not pull in any contaminants from the shop. However, if you have a dedicated room for spraying that is separated from activities that produce dust or debris, you may be able to get a less expensive open-sided booth. There are two sets of dimensions to consider when preparing to buy a spray paint booth: internal and external. Internal dimensions are based very simply on the largest part or product you need to paint. Measure the width, length, and height of the item, then add at least three feet on each side to give your workers space to move around. If you use an automated spraying system, you may need to allow even more space for the machinery to operate. This will give you the minimum dimensions you need inside your spray booth. The external dimensions are limited by the room where your booth will be housed. Typically, spray booths are placed within existing buildings, so they must fit between existing walls and support columns and below overhead obstacles. Measure the available space to determine the maximum external dimensions you can accommodate. In general, paint booths are sold by internal dimensions as that’s usually the most important measurement. Standard booths are offered in two-foot internal increments but can be customized to fit your needs. 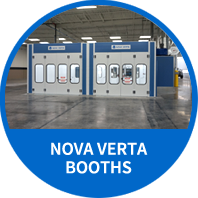 Once you know what size booth you need and the type of airflow you want, you’ll have to consider several other options, including air make-up units, lighting, and safety features. Adding a spray booth inside your plant or shop can wreak havoc with your HVAC systems. 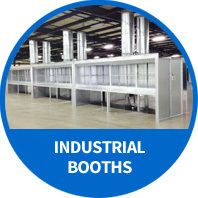 Consider that small booths can have a negative airflow of 10,000CFM, while larger booths can reach 50,000 CFM or more. All the air being pulled into the booth and vented to the outside has to come from somewhere—which is why we suggest a heated air make-up unit to maintain a positive pressure in your booth for a cleaner painting environment. Without an air make-up unit, air is being drawn from the rest of your building. As the pressure inside starts to drop, outside air will be sucked in through every tiny gap and crack in the walls to replace it. If you’re heating or cooling your building, the difference in temperature will substantially increase your gas and electric costs, and doors will be difficult to open due to the negative pressure created by the exhaust fan. An air make-up unit solves this problem by providing a clean direct source of air for the booth. The air make-up unit pulls in outside air through a dedicated vent, heats it if necessary, and supplies the resulting air directly to the intake filter. Air make-up units add quite a bit to the initial purchase price of a spray booth – frequently more than the booth itself. However, to avoid serious air quality problems and uneven heating or cooling, they are worth the expense. Whatever type of finish you are applying will be greatly improved. Adequate lighting is essential to many spray booth applications. Most booths come with several banks of special explosion-proof lighting. Make sure the location and number of lights is appropriate for your work. You can easily install additional lights on your own with many of our booth models. Consider access to the lights when choosing a location for your booth. In most cases, lights are accessed from outside the booth. You can also order inside access lights in structures built against a wall so you can still easily change your burned-out bulbs. Operators of spray paint booths are required to comply with a several federal, state, and local regulations to protect both employees and the environment. These rules vary quite a bit, but the most important aspect to remember is that your local regulations trump any others. Many states will require an ETL listing on the booth and may require a wet stamp from an engineer, which can range from $750 to $2,000. So be sure to ask your supplier the right questions. If you need help please give our booth specialists a call at 1-800-637-4027. Meeting with your local fire marshal or building inspector is the most important step in compliance. The vendor you choose should be able to provide general guidelines and as much help as possible.Local authorities generally have the final word on what type of installation, safety equipment, and operating procedures are required. The safety features you may need include a fire suppression system, either dry chemical or water-based, depending on the substances being used in your application. There may be specific airflow requirements based on the type of spraying you do and the size of the booth. And you’ll have to comply with standard regulations concerning electrical wiring and fire exits. Insulation: Double wall insulated booths offer a cleaner and neater appearance on the exterior of the booth. There are no exposed nuts and bolts nor is there any where for dust to collect. Variable Frequency Drive: Allows the operator full control of the paint booth balance and speed of the exhaust fan. Powder coat finish: White powder coating helps improve overall brightness in the booth and protects the steel. Product Doors: Choose from drive-through, bi-fold, roll up, standard walk-through, or other types of entry doors to match your needs. 90/10 Recirculation: This option allows you to recalculate 90% of the heat during the bake cycle to allow for the best possible energy savings for you and your shop. Basement: A basement is available in place of a pit being dug in your shop floor. This option allows you to still have a full downdraft booth in a rented or leased building without having to dig up the existing floor and concrete.